Maniago is a town and comune located in the Province of Pordenone, Friuli-Venezia Giulia. It is known principally today for its production of steel blades which are used by the big name producers of knives, scissors, and shears which are exported worldwide. 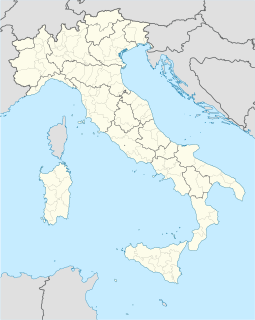 The province of Pordenone was a province in the autonomous region of Friuli-Venezia Giulia in Italy. Its capital was the city of Pordenone. The province was subdivided from the province of Udine in 1968. It had a total population of 312,794 inhabitants. The province was abolished on 30 September 2017. Renato Castellani was an Italian film director and screenwriter. He won the 1952 Gran Prix of the Cannes Film Festival for his film Two Cents Worth of Hope. The Countess of Parma is a 1936 Italian comedy film directed by Alessandro Blasetti and starring Elisa Cegani, Antonio Centa and María Denis. Marcella, a mannequin working in a fashion store in Turin, falls in love with an Italian International football player whose aunt has just acquired the store intending to replace its reliance on French fashions with Italian designs. Bayonet is a 1936 Italian historical film directed by Ferdinando Maria Poggioli and starring Nerio Bernardi, Leda Gloria and Mimì Aylmer. 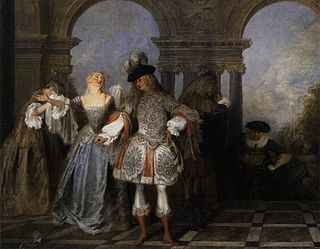 It portrays the life of Giacomo Casanova. The Two Sergeants is a 1936 Italian historical film directed by Enrico Guazzoni and starring Evi Maltagliati, Gino Cervi and Mino Doro. It was based on the play The Two Sergeants by Theodore d'Aubigny, which has been made into films several times. It is set in the Napoleonic Wars. The film marked the debut of Alida Valli who had until recently been a student of the Centro sperimentale di cinematografia. Valli went on to be a leading star of Italian cinema. Enrico Viarisio was an Italian theatre and cinema actor. Camillo Pilotto was an Italian film actor. He appeared in 101 films between 1916 and 1963. He was born and died in Rome, Italy. Enzo Biliotti was an Italian film actor. He appeared in 80 films between 1916 and 1958. He was born in Livorno, Italy and died in Bologna, Italy. Antonio Gandusio was an Italian film actor. He appeared in 34 films between 1914 and 1948. He was born in Rovinj and died in Milan, Italy. Giovanni Grasso was an Italian stage and film actor. He appeared in 82 films between 1910 and 1955. He was born and died in Catania, Sicily, Italy. Margherita Bagni was an Italian actress and voice actress. She appeared in 37 films between 1918 and 1959. She was born in Turin, Italy and died in Rome, Italy. Silvio Bagolini was an Italian film actor. He appeared in 137 films between 1936 and 1973. Paul Westermeier (1892–1972) was a German film actor. Lamberto Picasso was an Italian film actor. He appeared in 70 films between 1914 and 1953. Mario Bonnard was an Italian actor and film director. Otello Toso was an Italian film and stage actor. Eraldo Da Roma was an Italian film editor best known for his work with Roberto Rossellini, Vittorio De Sica, and Michelangelo Antonioni. Massimo Terzano was an Italian cinematographer. Terzano was a leading figure in the Italian film industry, working on over eighty films during the silent, Fascist and post-war eras. His final film was The Barber of Seville, made shortly before his death. Romolo Costa (1897–1965) was an Italian film actor who appeared in more than seventy films and television series between 1934 and 1964. He also worked extensively as a voice actor, dubbing foreign films for release in Italy. Costa was a character actor who generally appeared in supporting roles. Occasionally he played a more prominent role as in Il destino in tasca (1938). Loris Gizzi was an Italian actor and voice actor. Cesare Polacco was an Italian actor and voice actor. Umberto Sacripante was an Italian film and stage actor. 1 2 3 Roberto Chiti, Roberto Poppi. Dizionario del cinema italiano : Gli artisti : Vol. 3, Gli attori dal 1930 ai giorni nostri. Gremese Editore, 2003. ISBN 8884402131.